We have a sailing date. If the weather is good on Friday the 9th of March, Lady Jane's skipper, John, will take her round to the Itchen. If the weather does not co-operate, we also have the option for Saturday or Sunday open to us. That means I have nine days left to get the myriad of bits and pieces that need doing done. At 10.00 on a cold and wet Sunday morning, with nothing yet done, Fred's cheerful encouragement to get moving is sorely missed. Fred is away on his annual pilgrimage to Australia. I'm planning on us powering through all the must do's during this week, then focusing on finishing off as much as I can in the following week. Inevitably some tasks will have to be abandoned, but I'm happy enough that all the essential stuff is done, or at least well in hand. One of the final tasks will be to give Lady Jane a good old clean up. As you can see from the picture junk essential stuff has piled up all over the place in the scramble to get things done. 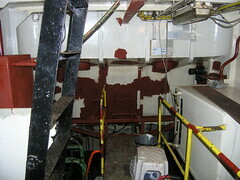 I didn't include a picture showing the state of the deck, as it's a real shambles and just too embarrassing to publish. It will all be sorted by the time we leave John, I promise. One supposedly trivial task I have on my list is to change the solenoid for the steering gear. To explain, Lady Jane has manual steering - which is, in effect, simply a pump which pumps hydraulic fluid to the steering rams. Turning the wheel to the left pushes one ram, while turning the wheel to the right pushes the other ram, the rams push directly onto the rudder, and so Lady Jane is turned to port or starboard. That is all well and good, but a bit labour intensive. Lady Jane also has electric powered hydraulic steering, driven by a hydraulic pump and worked using two simple buttons. 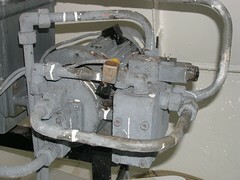 The buttons control a pair of solenoids, which direct the hydraulic fluid to one or other of the rams. This system could also be connected to an auto pilot, if I had one that worked. The picture shows the 110v DC electric motor, the hydraulic pump, one of the solenoids and other pipes and things. Since I've owned Lady Jane, the electric powered hydraulic steering has never worked. From the beginning, I've always been told 'all you need to do is just change the solenoid'. Problem number one - someone else has already tried removing the solenoid and wrecked the allen key heads on the bolts. The heads on the screws holding the electric connectors in are also completely destroyed. Problem number two - the steering solenoids are 110v DC - a device apparently unattainable. Now I'm left with a steering system slowly seeping hydraulic oil where the solenoid used to be, no immediate means of replacing the troublesome solenoid and, to add insult to injury, no available replacement for the bolts I had to cut off to get the defective solenoid out. On the positive side, I think the 'defective' solenoid may not be broken, and that it had simply been jammed on account of it rusting in place. Possibly because it had not been used for some time. Interestingly, for me anyway, there are a lot of bits in that solenoid. Including a spring, which I may have lost. Obviously something must be done before I go, else the manual steering may not work if things are just left as they are. 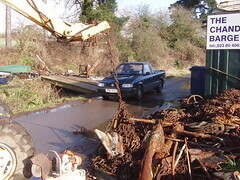 I went to The Chandlery Barge, in Bursledon, on my hunt for some chain. They were very helpful there, as you can see in the picture they even wheeled out their strange lifting machine so I could get exactly my choice of chain from the bottom of the pile. For all the effort, and holding up local industry, I only came away with two short lengths of chain and more knowledge on the subject. I now know you can get long link chain, short link chain (obviously) and stud chain. Probably others as well, I didn't ask. The upshot of all this is that I'm not going to get my chain this way. The guy from the chandlery patiently pointed out that I still need to order chain, and what I ordered would not necessarily match the chain I'd measured, so I'd be back at square one with a load of expensive chain to sell. Plan B now is to actually take the gypsy up to a chain manufacturer, get them to size up the right chain and buy it there and then. Makes sense to me. Now I just have to find the right chain manufacturer. With the winch now mounted on deck, my search for the right chain is intensifying. I can now be found wandering around waterfronts with a measuring tape and an eye out for anchors, chain and winches. 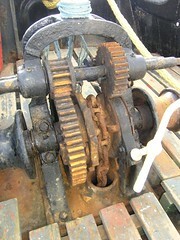 The picture shows the winch on Jan's tug, Storebror. What I'm trying to do is find out exactly what size chain I need for my winch, then I can find suitable second hand chain or, if push comes to shove, buy new chain. My strategy at the moment is to try to buy short lengths of chain, say 1 or 2 metres (3-6 ft) long, then try those lengths through my gypsy until I find a size that fits. Buying a full length of chain, then discovering it does not fit will be just too troublesome and expensive. I'm making steady progress on the list of things to do. 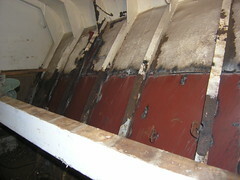 The picture shows the deck plates in the engine room finally being secured. I had intended to give them a good clean before starting to secure them, but could not resist trying my new Hilti self drilling screws as soon as I could. 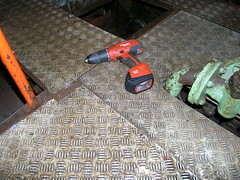 You can just see a few of the screws lying on the deck in front of the Hilti screwdriver/drill (Thanks Mark). The handy thing about these screws is that all you need to fit them is a drill, nothing else. No fiddling about with a drill, then lining up holes and screwing in those self tapping screws. I need to put in quite a few of these screws, as almost none of the deck plates are still fastened down. I also need to replace a missing plate, as it seems to have got itself lost over the last few years. 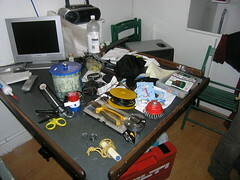 Here you see the a picture of one of my workbenches. If everything in the picture looks terribly squiffy to you, it's because everything really is all out of shape. This is because another of my workbenches has been mercilessly crushed by Lady Jane. In an unrelated incident, the platform had got itself jammed underneath Lady Jane's stern, so it's also at a weird angle in the picture. It's true to say that the platform/workbench combination has been a source of some pain. Ah well, as I've said before - pride comes before a fall. At least this time the workbench has not been completely destroyed, unlike the last one. 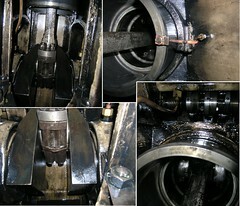 The oil in Lady Jane's main engine is now changed. Thanks to Captain Rick on the Wanderbird for his helpful advice. As part of the process, I opened a few of the lower side plates so I could pump out any oil remaining in the sump, and clean up the sludge as best as I could. Having the side plates open also gave me an opportunity to peer into the engine itself. I think the resulting pictures came out pretty well - considering. I'm surprised to see that the engine is painted inside, as well as outside. I don't know why, but it just seems weird to me that the inside of the engine should be painted. After all, as you can see, it's coated with oil the whole time, so there should be no problem with rust or anything. With the oil changed, and on running the main engine, I notice a marked increase in the engine's oil pressure. Another job complete, and another positive step towards sailing. There is so much to do in the engine room. As you can see, just the cleaning in there is going to take forever. The picture shows Robin deep in the bowels of Lady Jane's engine room, surrounded by all sorts of interesting engineering stuff. 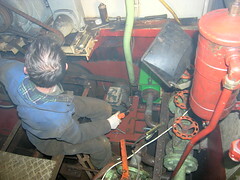 In fact he is working on installing the 24 volt generator - the blue lump you can see in amongst all the red paint there by his knee. This marks the completion of two key tasks in the engine room - reconnecting both the 110 and 24 volt generators. These generators were originally taken offline as part of the bulkhead project, way back in July 2005. It is so good seeing things finally coming together, ready for sailing at the end of the month. I've had a day completely dominated by oil - lots of it. One of the things on the list has been to change the engine oil - a well overdue task by the way. After discussion with Robin, about the type and quantity required, I set about changing the engine oil myself. 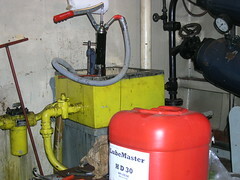 The first task being to actually go and buy the stuff - 230 litres (60 US Gallons) of top quality diesel engine oil. As it turned out, it was some £70.00 cheaper (140 US$) to buy a barrel of oil and a pump than it was to buy the equivalent oil in 25 litre (5.5 US Gallon) containers. Obviously, I opted for a barrel of oil and the pump. As you can see in the picture, the oil pump also proved handy for pumping out the old oil, as there is no obvious way of otherwise getting the engine oil out of the boat's oil system. Rick - any ideas? Now I have a load of dirty old oil on deck, stashed in a collection of odd containers, ready to transport to the nearest oil disposal point. It's been hard work just getting this far. Once I have all the old oil safely disposed of, I can then start transferring the new oil down into the engine room, and so into the engine's oil system. It's a background task, I know, but nevertheless pretty important. Over the years the engine room and fiddly deck (the space above the engine room, shown in the picture) have been getting progressively more filthy. The sheer size of this job is not to be under-estimated. So far, Fred, Andy and Pat have all slaved away at helping clean up the place. Readers who have been on Lady Jane before now will recognise just how clean, and clear, the fiddly deck space now looks. Finally the rusty patches inside are being disappeared. I was just going to accept that the anchor winch was going to remain all jammed up, and use it like that. After discussion with Robin, and further thought, it became clear something had to be done to get it all sorted out properly. The thinking being the gears would take unnecessary punishment, as they would be permanently engaged. The other thought was that if the gypsy suddenly freed up on the shaft while hoisting the anchor, the ensuing problems could prove 'interesting'. It also occurred to me that it could be dangerous if the anchor was let go with the winch stuck in gear and the handle still attached (easily done I suspect). With the decision made, I set about dismantling the shaft from the winch, and carted the whole thing over to Kendalls, where they regularly have bonfires. 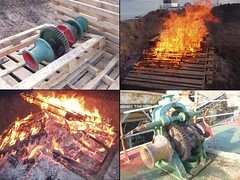 The morning after a nice warm afternoon burning stuff, with my shaft buried deep in the middle of it all, I collected a somewhat dirty lump on which, with liberal dousing with oil, the various bits and pieces were now magically loosened by the fire. After some effort hoisting and reassembling the thing, I now have a perfectly operational anchor winch, with warping drums, on the front deck. Even the brass key is loose, such that I can now slide it by hand. Thanks to Malcolm for the help cleaning off the mess from the fire and for the help with hoisting it. All the winch needs now is a lick of paint to re-instate it back to it's former glory. My old, not so reliable, rib (aka HBI) engine has finally been upgraded to a more modern, second hand one. All done for a pretty good price. The justification for spending all this money now is that the rib will be used as Lady Jane's life raft and tender, able to push or pull Lady Jane about if needs be. Initial testing shows that the rib is really going to fly now. 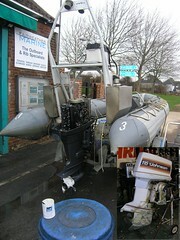 The picture shows the new engine being fitted to the rib by the nice folks at Fairweather Marine. Thanks guys. You can see the old engine in the inset. I like the idea that it's going to be given to a local college, so it can give some final value to students learning about engines and all that good stuff. So far I've only been down the creek, as far as Portsmouth harbour, with my new engine. Sadly the speed limit is 10 knots so, of course, I've not been able to crank it up to the max yet. Suddenly the urge to survey my mooring in the Itchen is becoming overpowering. Hmm, I think I'll take the rib! The new plating on the port side is finally all in and welded. It's taken far longer than I'd expected, mostly on account of the weather. The picture shows the new plate on the port side, taken from inside the forepeak, with just a few smaller sections still to be welded in. Next will be to cleanup the rust, grind off the handles welded on so the plate could be pulled into the shape of the bow and then give the area a lick of primer to protect the new steel. The rest of the plating work on both the deck above and on the starboard side will have to be abandoned, as this is just taking far too long. The target date for moving is set for the end of February, so the pressure is on to finish all the essential tasks before then. 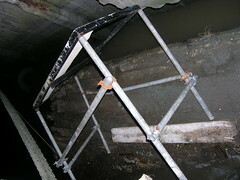 The focus of work will now turn to getting the anchor system in and working. When the weather is poor, I still have servicing the engine and related machinery to attend to.